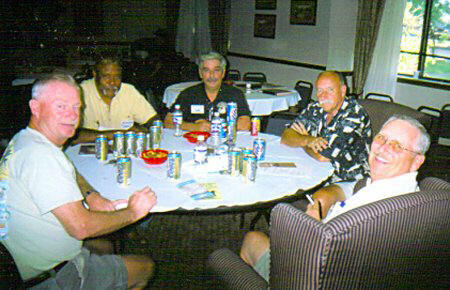 This page of 2006 Reunion photos was sent in by Chuck Steward. Thanks, Chuck! 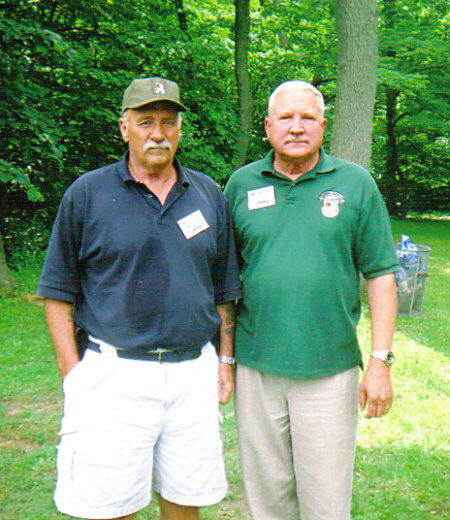 Here we have Chuck and Jerry Pritchett standing with Norm Shaw in front. 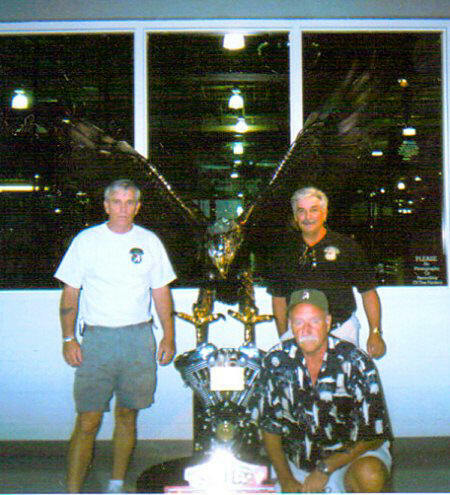 They were at the Harley Davidson plant, and were seen shortly afterward writing: "Dear Santa, All I want for Christmas is a Harley Model......."
Personally, I'd love to see all of the Big Red One Trackers show up at the Texas 2007 Reunion riding up on Harleys! Norm Shaw at the picnic - "OK, I got the fruit, now where's the food?" 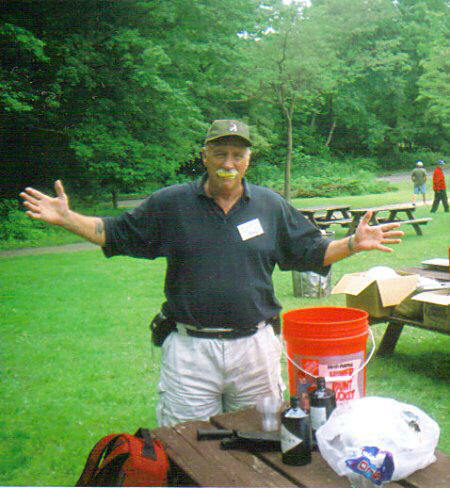 The large container in front of Norm became the mixing bowl for the Pimm's Cup - a blend of alcohol and fruit, bugs and other delights chopped with a kukri by one Dr. Don Hendricks - just as it was done at JWS! 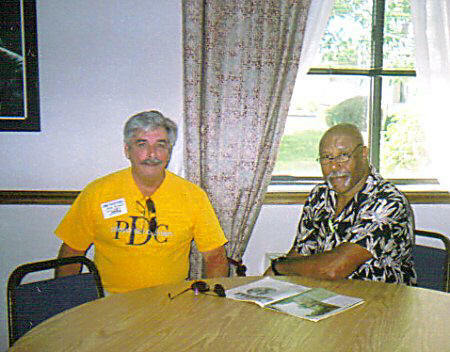 Jerry Pritchett and Jearald Dudley. Jearald is telling Jerry, "You're NEVER too old to have children!" - He can say this because HE HAS A THREE YEAR OLD! - Jearald, you are the man! Working out the solutions for the world's problems! 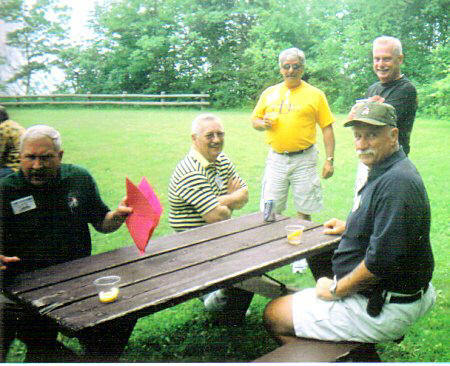 From L to R: Ed Wheeler, Jearald Dudley, Jerry Pritchett, Norm Shaw and Denzil Lile. This important conference took place at 0800! Don Hendricks is recalling how he saved an entire Gurkha regiment and his team from the giant eight foot scorpion. Denzil Lile was not present for this amazing event, but Jerry Pritchett (who is ever camera ready, according to Chuck), Ed Wheeler and Norm Shaw are all ready to swear affadavits to the single-handed rescue by Don. In this photo, Don is describing the length of one of the scorpion's toenails - from his right hand to the folder being held in his left hand - and that was only the pinkie toenail! Ask Johnny Gurkha! Thanks again, Chuck, for these great memories!